With the advent of Donald Trump and Hillary Clinton as presidential nominees, the examination of the role of celebrity culture in the White House takes on a fresh appeal. This book, by award-winning White House correspondent and presidential historian Kenneth T. Walsh, takes a detailed and comprehensive look at the history of America’s presidents as "celebrities in chief" since the beginning of the Republic. Walsh makes the point that modern presidents need to be celebrities and build on their fame in order to propel their agendas and rally public support for themselves as national leaders so that they can get things done. Combining incisive historical analysis with a journalist’s eye for detail, this book looks back to such presidents as George Washington and Abraham Lincoln as the forerunners of contemporary celebrity presidents. It examines modern presidents including Barack Obama, Bill Clinton, Ronald Reagan, John F. Kennedy, Franklin Roosevelt, and Theodore Roosevelt, each of whom qualified as a celebrity in his own time and place. The book also looks at presidents who fell short in their star appeal, such as George W. Bush, George H. W. Bush, Richard Nixon, and Lyndon Johnson, and explains why their star power was lacking. Among the special features of the book are detailed profiles of the presidents and how they measured up or failed as celebrities; an historical analysis of America’s popular culture and how presidents have played a part in it, from sports and television to movies and the news media; the role of first ladies; and a portfolio of fascinating photos illustrating the intersection of the presidency with popular culture. An update looking at Hillary and "the Donald" puts contemporary politics in perspective with the evolution of presidential celebrity. Kenneth T. Walsh is the chief White House correspondent for U.S. News and World Report. He is the author of the daily blog "Ken Walsh’s Washington" for usnews.com, and "The Presidency," a weekly column for usnews.com. He has covered the presidency since 1986 and is one of the longest-serving White House correspondents in history. Walsh is the former president of the White House Correspondents’ Association and has served as an adjunct professor of communication at American University in Washington, DC. He is the author of seven books, including Prisoners of the White House and Family of Freedom, published by Routledge. Ken Walsh brings his keen eye to one of the defining aspects of the modern presidency. 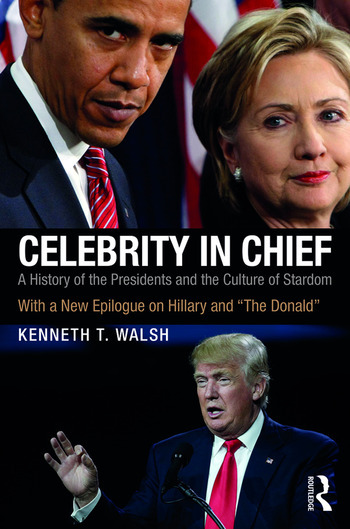 In this entertaining and informative book, Walsh provides a fascinating look at the ways in which celebrity culture has shaped presidential politics in recent decades. The book is sure to contribute to debates about the future of the White House and the health of American democracy.